A complete mental act with an impossible object! You present a bottle with a full deck of cards inside. (You can hand out the bottle for examination). The spectator selects one of five playing cards (no force!). With the heritage from your grandpa you are able to reveal any selected card. You can perform this on stage and even close up. Build the routine up to 4-5 minutes. How to build the other gimmicks - they are very easy. 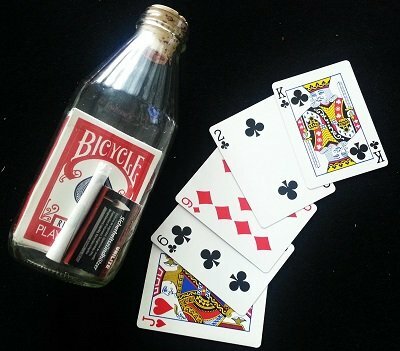 (You will also learn an easy way to put a playing card inside a cigarette). Excellent teaching on how to make the Impossible Object! You can also hand out the bottle as a souvenir!